Brightonwoods Orchard is a family run orchard featuring over 150 apple varieties, seeded and seedless grapes, quince and pears. We are located in Southeastern Wisconsin on one of Wisconsin's Rustic Roads between Milwaukee and Chicago. There is no admission fee and we have something for everyone to enjoy. We are not a pick your own orchard, but visitors are free to roam through our orchard and woods trail. Every week Brightonwoods Orchard has newly picked varieties. Check out our latest list on Facebook. In addition to apples and cider we carry many fall favorites including Wisconsin cheese, gourds, squash, honey, jams, jellies and more. Look for Hoyer Homestead, Farm & CSA at Brightonwoods Orchard this fall on Saturdays and Sundays, starting Saturday, Sept. 22nd. Brightonwoods Orchard is not a "Pick Your Own" orchard, but with over 150 apple varieties throughout the season, there is always a new apple to try. We've got something for the whole family. Take a walk through our orchard or woods trails then relax while the kids play in our two story treehouse. The Caledonia Lions' Club Car Show & Cruise In was Sunday, September 23rd. It was a fantastic year for great cars! 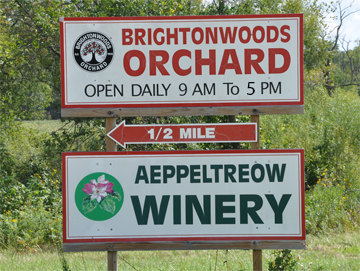 Brightonwoods Orchard is located in Burlington, Wisconsin on one of Wisconsin's Rustic Roads – 10 miles west of I-94 between Milwaukee and Chicago. During your visit, check out AeppelTreow Winery & Distillery, a separate on-site business, that produces small batch cider, perry and spirits. We are excited to feature Glas All Naturals products made with all natural goodness right here at Brightonwoods Orchard.